Let me start this review with the disclaimer that I am probably not who the author envisioned reading his book. Not his "target audience". The story follows Roy Eberhardt who has moved to a new school in Florida and, as the new kid, is obviously picked on by the biggest bully at Trace Middle School. The principal is unsympathetic and he has a skateboard-obsessed follower, who I wish he had bothered to become friends with. Roy gets caught up in a plot he doesn't understand at first when he decides to follow a boy he sees running through the town who is not wearing any shoes. Strange things start happening at the site where there will soon be a Mother Paula's Pancake House, including alligators in the portable builders' toilets and spray paint on an officer's car windows. I thought the book was fairly fun, but Roy's parents are the most cardboard, two-dimensional characters I ever saw. Actually, most of the characters were. We don't even know that much about Roy other than he just wants to blend in and he misses Montana. I guess younger readers don't need all that much in the way of character-building. I did enjoy that the site is home to burrowing owls, and the whole idea is to save them from death because they're a protected species. They sounded quite cute, these little owls. There are some funny-ish shenanigans and switching places, tricking parents and running from the police. Overall, I don't think I'd recommend this book to anyone my age because it was a rather linear plot and everyone's intentions became clear very quickly. There was no thinking involved, and honestly I just couldn't wait until it was over. 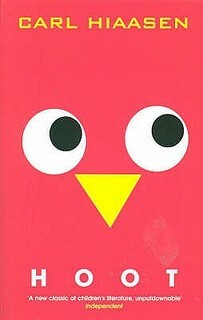 Carl Hiaasen's writing style is not bad, but I won't be looking for more of his books.